Marines in the Communications field are integral to all elements of this branch of the U.S. military. Consider how important it is to relay accurate information in a timely way when in a combat situation. But there's more to this field than radio communications. Marines in this field are responsible for the design, installation, connection, and operation of communication networks and information systems used to transmit information and data throughout the entire Marine Air-Ground Task Force. Communications Marines are part of every ground force mission, as specialists, and keep the critical flow of information moving. Marines in this field also operate and perform preventive maintenance on both hardware and software systems including telephone, teletype, switching, radio, cryptography and computer systems. The training for communications jobs in the Marines includes basic training, then combat training. After that, Marines in this field go to Communications Systems Training at the Marine Air Ground Task Force Training Command in Twentynine Palms, California. In order to be successful in this field, Communications Marines need basic to advanced language skills and must be able to master precise communication and computer procedures, as well as interact on a daily basis with users to solve communication systems challenges. Attention to detail and the ability to work closely with others are essential requirements. Eligibility for a security clearance is a requirement for some communication systems specialties, due to the sensitive nature of much of the information they'll be handling. Marines entering Communications Systems are assigned the designation of MOS 0600, Basic Communications Systems Marine. Entry-level jobs for Marines in the communications field include work as a field radio operator, wireman, multichannel equipment operator, satellite communications equipment operator, information systems specialist, data network systems specialist, and information assurance and information security technicians. The opportunity to participate in a formal apprenticeship program leading to receipt of a Department of Labor Certificate of Apprenticeship Completion may be available. Below are other Marine Corps enlisted military occupation specialties which are organized under this occupational field. 0612 Tactical Switching Operator: Typical duties of this job are to install, operate, and maintain analog, TDM, and internet telecommunications that are reliable to transmit classified and unclassified voice, video and data. 0613 Construction Wireman: This MOS operates specialized construction equipment to install underground and above ground cabling systems in buildings and maintaining aerial cable distribution systems. 0619 Telecommunications Systems Chief: Marines in this role are in charge of managing the budget, inventory, plans, quality control, and inside and outside plant telecommunications networks. 0621 Field Radio Operator: These Marines set up and tune of radio equipment including antennas and power sources, in order to make establishing contact with distant stations, changing to frequencies and cryptographic codes and maintaining equipment are required by the radio operator. 0622 Digital (Multi-channel) Wideband Transmission Equipment Operator: This MOS specifically focuses on installing, operating and maintaining the AN/MRC-142 Digital Wideband Transmission Systems (DWTS) which is essential to effective internet communications. 0623 Tropospheric Scatter Radio Multi-channel Equipment Operator - These Marines install, operate and maintain the AN/TRC-170 (Tropospheric Scatter Microwave Radio Terminal). This enables wireless communications between stations over 100 miles apart. 0627 SHF Satellite Communications Operator-Maintainer: These Marines install, operate and maintain various satellite communication platforms to handle classified and unclassified data in both Marine bases and when deployed. 0629 Radio Chief: This Marine is a staff sergeant and above and is responsible for preparing and executing radio communications. The radio chief has additional responsibilities and must understand maintenance and be familiar with budgeting, and administration of reliable radio operations. 0648 Spectrum Manager: This Marine also is a staff sergeant and must be an expert of all DOD/Service and commercial S-D equipment and systems. 0651 Cyber Network Operator: This MOS installs, configures and manages cyber network systems including Microsoft based curriculum and MS Exchange/Server, Cisco Certified Network Associate (CCNA) modules 1, 2 and 3, as well as other authorized cyber network systems. 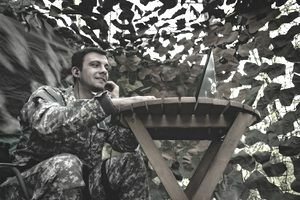 0659 Cyber Network Systems Chiefs: This MOS installs, operates, integrates and troubleshoots in order to maintain optimum secure cyber communication systems. 0681 Information Security Technician: The Marine in this MOS serves as the primary functional proponent for cryptographic key management infrastructure making communications secure. 0688 Cyber Security Apprentice: The Marine in this MOS secure the internet communications systems. They execute security policies, implement cyber network security measures and network intrusion detections. They also assist with forensics and assist with security incident handling along the network. 0689 Cyber Security Technician: This MOS is responsible for ensuring Marine Corps information systems data availability, integrity authentication, confidentiality, and non-repudiation. 0699 Communications Chief: These are the senior staff noncommissioned officers who directly assist communications officers in developing the communications plan. This senior MOS is responsible for the supervision of the installation, operation, and maintenance of communication facilities. Additionally, they must have an overall knowledge of maintenance, budgeting and administration fo the above field of jobs.